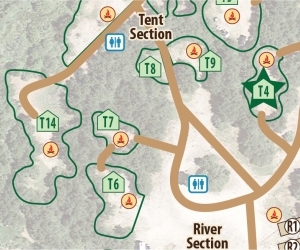 Prices shown for each site cover 1 RV or tent, 1 vehicle, and 4 people. 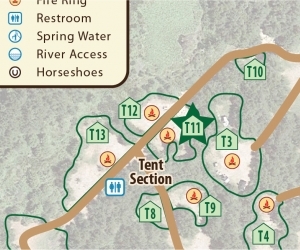 Additional charges apply for extra tents, vehicles, or people. First night's stay deposit to reserve a site. All but $5 may be refunded if notice of cancellation is given at least 2 days before check-in date. Email info@riverpondcampground.com to change or cancel a reservation. No show, no call, no email by 8 pm on check-in day forfeits reservation. Please let us know if you are going to be late and we'll be happy to hold your site. 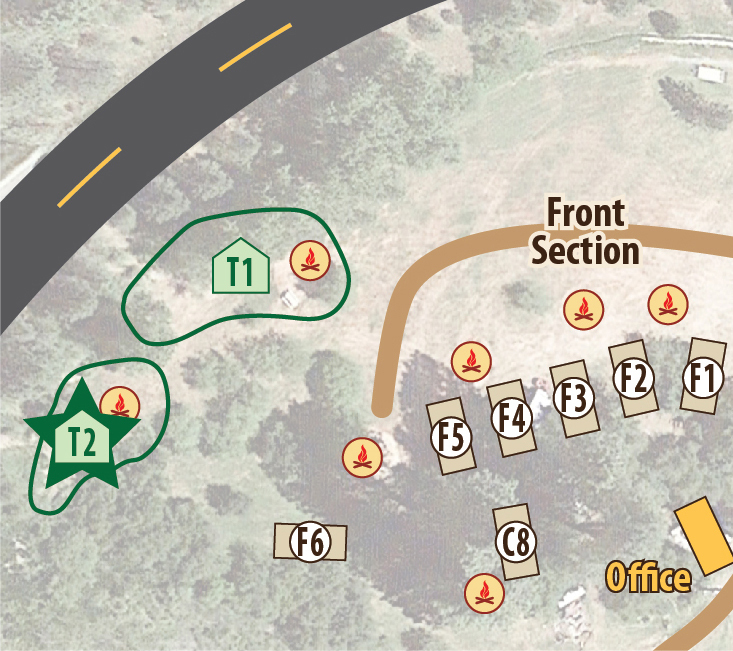 50A & 15A electric hookups, fire ring, partial shade, accommodates large RVs and about 2 tents. 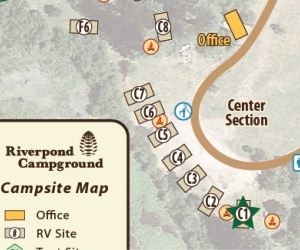 Site facilities: 50A & 15A electric hookups, fire ring, partial shade, accommodates large RVs and about 2 tents. Taxes: All taxes are included. Prepayment: $10 deposit to reserve a site. $8 may be refunded if notice of cancellation is given at least 2 days before check-in date. Call (208)462-8000 to cancel. 50A & 15A electric hookups, fire ring, full shade, accommodates large RVs. 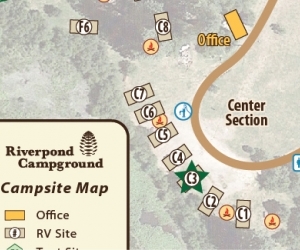 Site facilities: 50A & 15A electric hookups, fire ring, full shade, accommodates large RVs. 30A & 15A electric hookups, fire ring, full shade, accommodates large RVs. 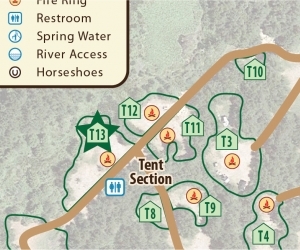 Site facilities: 30A & 15A electric hookups, fire ring, full shade, accommodates large RVs. 30A & 15A electric hookups, full shade, accommodates large RVs. 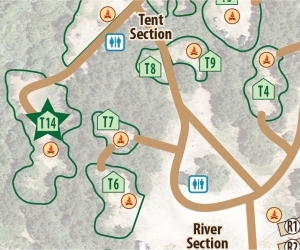 Site facilities: 30A & 15A electric hookups, full shade, accommodates large RVs. 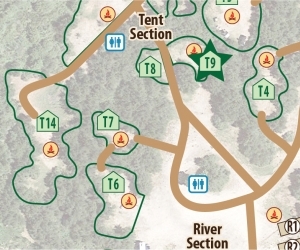 30A & 15A electric hookups, fire ring, full shade, accommodates large RVs and a tent. 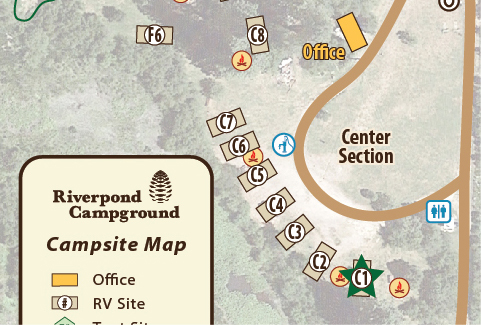 Site facilities: 30A & 15A electric hookups, fire ring, full shade, accommodates large RVs and a tent. 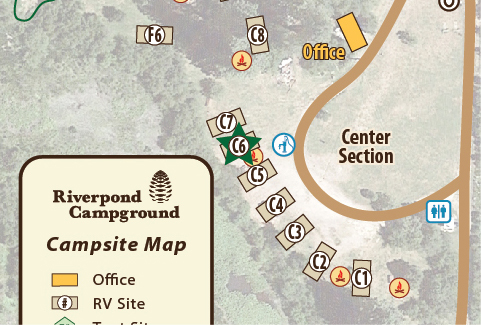 30A & 15A electric hookups, fire ring, full shade, accommodates large RVs and about 4 tents. 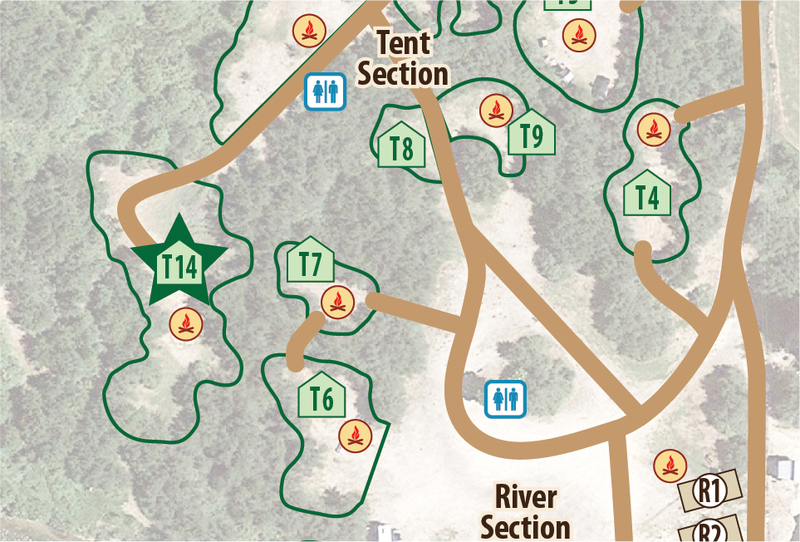 Site facilities: 30A & 15A electric hookups, fire ring, full shade, accommodates large RVs and about 4 tents. 50A, 30A & 15A electric hookups, fire ring, partial shade, accommodates large RVs and about 5 tents. 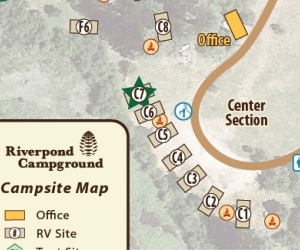 Site facilities: 50A, 30A & 15A electric hookups, fire ring, partial shade, accommodates large RVs and about 5 tents. 50A & 15A electric hookups, some shade, accommodates large RVs. 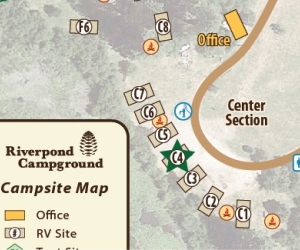 Site facilities: 50A & 15A electric hookups, some shade, accommodates large RVs. 30A & 15A electric hookups, some shade, accommodates large RVs. 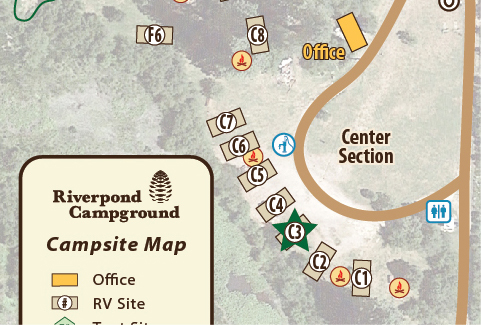 Site facilities: 30A & 15A electric hookups, some shade, accommodates large RVs. 30A electric hookups, fire ring, some shade, accommodates large RVs. 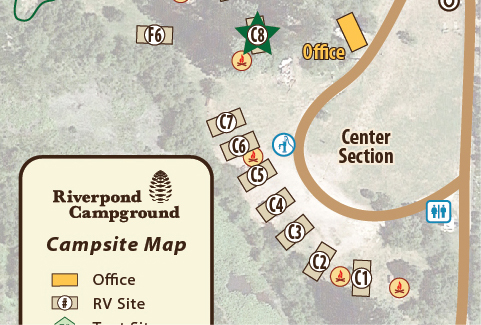 Site facilities: 30A electric hookups, fire ring, some shade, accommodates large RVs. 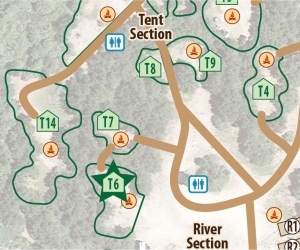 30A & 15A electric hookups, some shade, accommodates large RVs and about 2 tents. 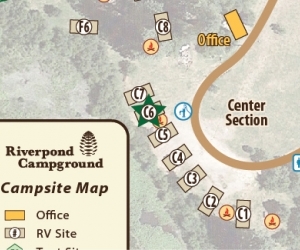 Site facilities: 30A & 15A electric hookups, some shade, accommodates large RVs and about 2 tents. 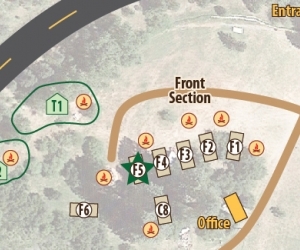 30A & 15A electric hookups, fire ring, partial shade, accommodates large RVs and a tent. 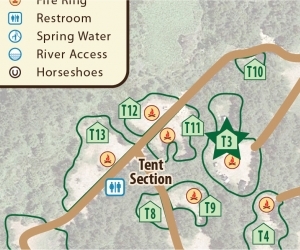 Site facilities: 30A & 15A electric hookups, fire ring, partial shade, accommodates large RVs and a tent. 50A, 30A & 15A electric hookups, fire ring, near the river, accommodates large RVs and about 3 tents. Site facilities: 50A, 30A & 15A electric hookups, fire ring, accommodates large RVs and about 3 tents. 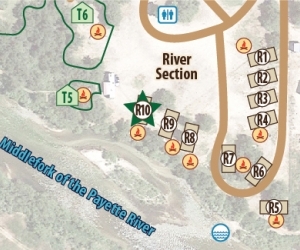 50A, 30A & 15A electric hookups, near the river, accommodates large RVs. 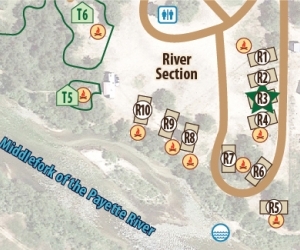 Site facilities: 50A, 30A & 15A electric hookups, near the river, accommodates large RVs. 50A, 30A & 15A electric hookups, fire ring, partial shade, near the river, accommodates large RVs. Site facilities: 50A, 30A & 15A electric hookups, fire ring, partial shade, near the river, accommodates large RVs. 30A & 15A electric hookups, fire ring, partial shade, river front, accommodates 25ft RVs. Site facilities: 30A & 15A electric hookups, fire ring, partial shade, river front, accommodates 25ft RVs. 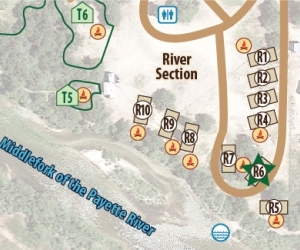 30A & 15A electric hookups, fire ring, partial shade, river front, accommodates 30ft RVs and about 2 tents. Site facilities: 30A & 15A electric hookups, fire ring, partial shade, river front, accommodates 30ft RVs and about 2 tents. 30A & 15A electric hookups, partial shade, river front, accommodates 30ft RVs. Site facilities: 30A & 15A electric hookups, partial shade, river front, accommodates 30ft RVs. 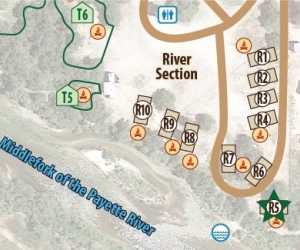 50A, 30A & 15A electric hookups, fire ring, partial shade, river front, accommodates large RVs. Site facilities: 50A, 30A & 15A electric hookups, fire ring, partial shade, river front, accommodates large RVs. 50A, 30A & 15A electric hookups, fire ring, partial shade, river front, accommodates large RVs and about 4 tents. Site facilities: 50A, 30A & 15A electric hookups, fire ring, partial shade, river front, accommodates large RVs and about 4 tents. Fire ring, good shade, accommodates about 5 tents. 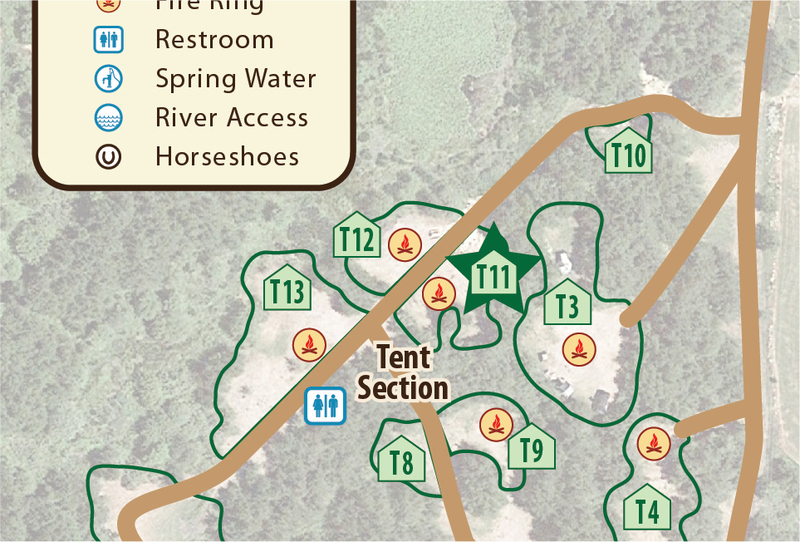 Site facilities: Fire ring, good shade, accommodates about 5 tents. Fire ring, good shade, good visual privacy, accommodates about 10 tents (2 tent minimum to reserve this site online $15+$10=$25). Site facilities: Fire ring, good shade, good visual privacy, accommodates about 10 tents (2 tent minimum to reserve this site online $15+$10=$25). 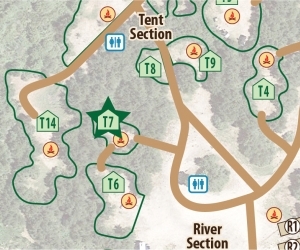 Fire ring, good shade, near the river, good visual privacy, accommodates about 6 tents (2 tent minimum to reserve this site online $15+$10=$25). Site facilities: Fire ring, good shade, near the river, good visual privacy, accommodates about 6 tents (2 tent minimum to reserve this site online $15+$10=$25). 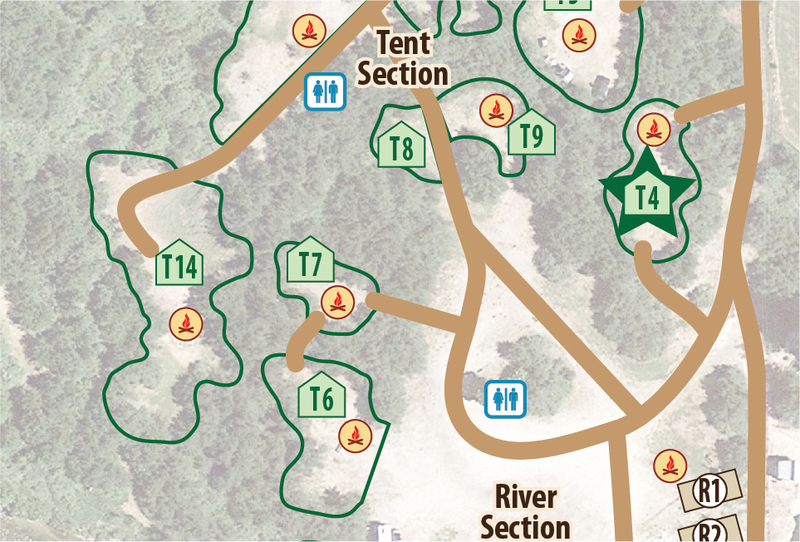 Fire ring, good shade, river front, good visual privacy, accommodates about 2 tents. Site facilities: Fire ring, good shade, river front, good visual privacy, accommodates about 2 tents. 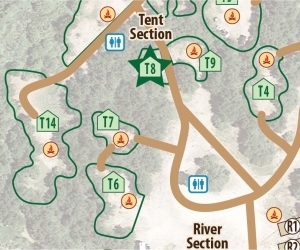 Fire ring, good shade, near the river, some visual privacy, accommodates about 10 tents (2 tent minimum to reserve this site online $15+$10=$25). Site facilities: Fire ring, good shade, near the river, some visual privacy, accommodates about 10 tents (2 tent minimum to reserve this site online $15+$10=$25). 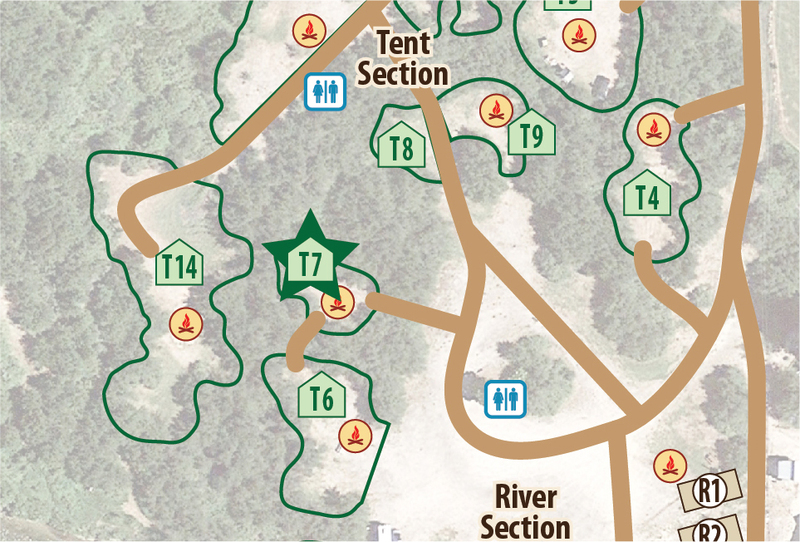 Fire ring, good shade, near the river, good visual privacy, accommodates about 4 tents. 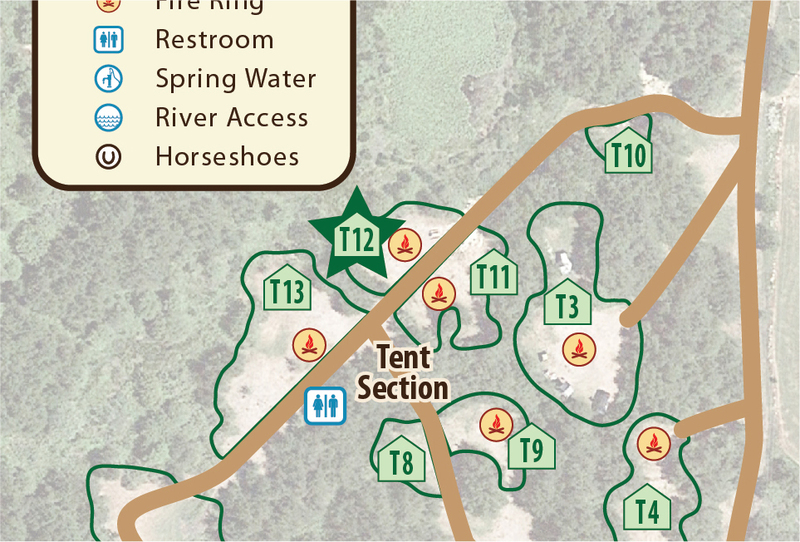 Site facilities: Fire ring, good shade, near the river, good visual privacy, accommodates about 4 tents. 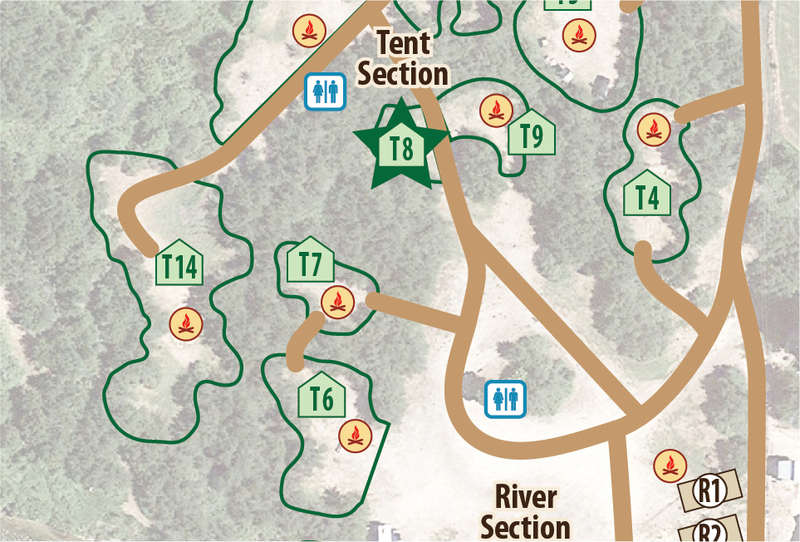 Good shade, near the river, accommodates about 1 tent. Site facilities: Good shade, near the river, accommodates about 1 tent. Fire ring, good shade, near the river, some visual privacy, accommodates about 6 tents. 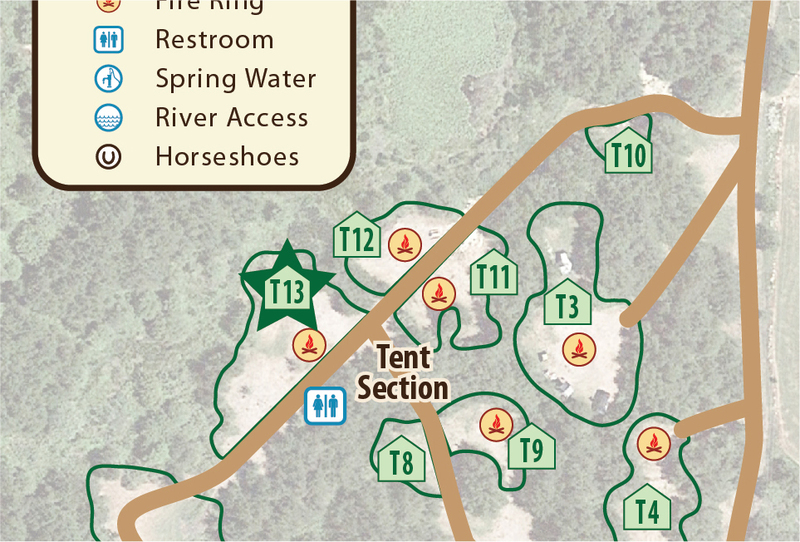 Site facilities: Fire ring, good shade, near the river, some visual privacy, accommodates about 6 tents. Full shade, accommodates about 1 tent. 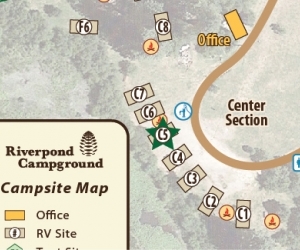 Site facilities: Full shade, accommodates about 1 tent. 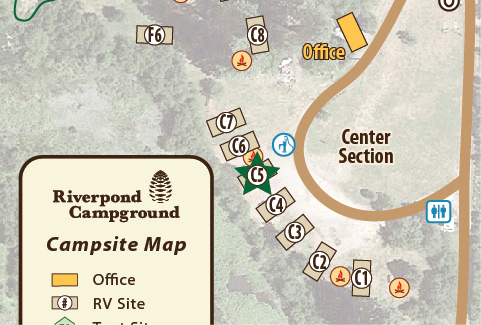 Fire ring, full shade, accommodates about 5 tents. Site facilities: Fire ring, full shade, accommodates about 5 tents. Fire ring, partial shade, accommodates about 3 tents. 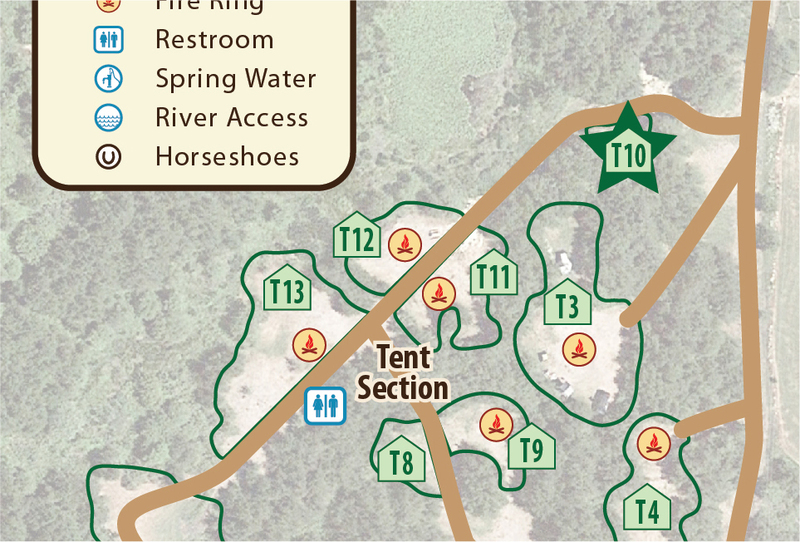 Site facilities: Fire ring, partial shade, accommodates about 3 tents. Fire ring, some shade, accommodates about 6 tents. 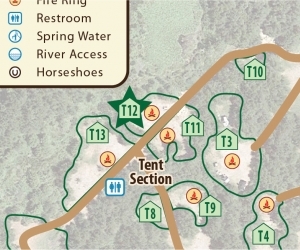 Site facilities: Fire ring, some shade, accommodates about 6 tents. 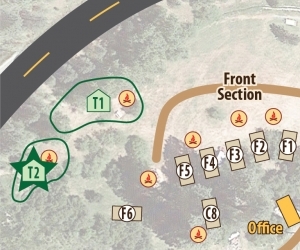 Fire ring, full shade, good visual privacy, accommodates about 10 tents (2 tent minimum to reserve this site online $15+$10=$25). Site facilities: Fire ring, full shade, good visual privacy, accommodates about 10 tents (2 tent minimum to reserve this site online $15+$10=$25). 24 Electrical Hookups for RVs. 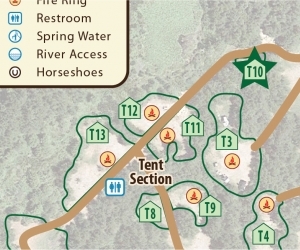 Many tent sites bordered by bushes offering some visual privacy. Excellent artesian well for drinking water and filling RV tanks. 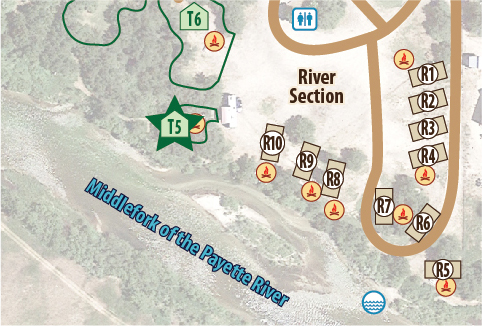 River access with a sandbar island to play on. Fire rings available for MOST sites, but not ALL sites. Please click "More info" for your desired site to see if one is included. 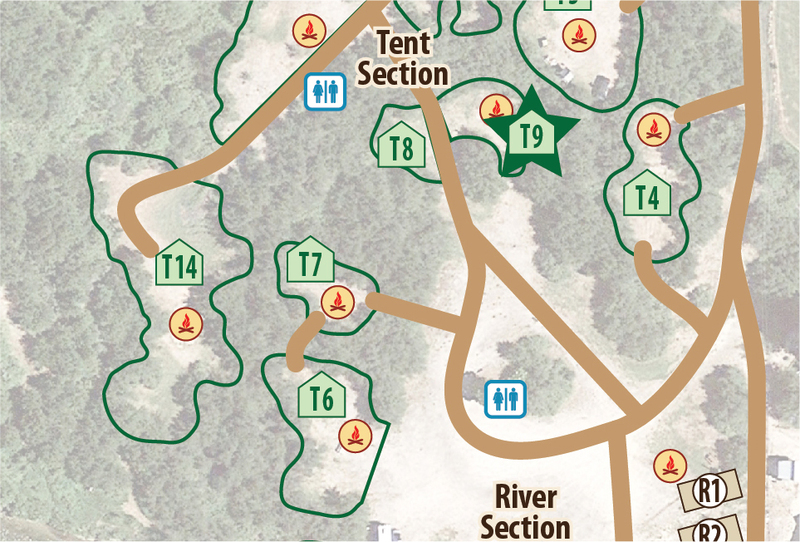 Fire rings are also marked on our campsite map. 3/4 of a mile from Crouch, which has restaurants, shops, a riverfront park, and a good sized grocery store. It's only a 15 minute walk or 2 minute drive. Float the river from Crouch's Weilmunster Park right back to our campground. It's a gentle 30 minute float back to our riverfront access. Go shooting at Garden Valley's gun range. 7 miles up Banks Lowman Rd, across the road from the grass airport, is a developed shooting range that is free to use (donations are encouraged). 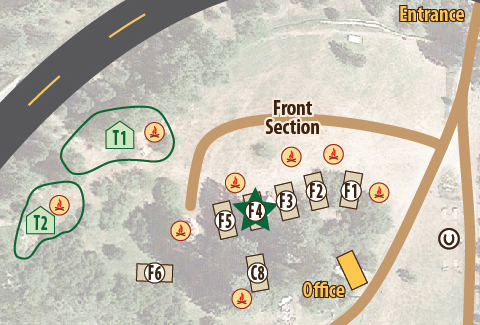 There are many sheltered shooting tables, sturdy target stands set at 50 and 100 yds, and a shotgun range. Go rafting on the world class Payette river. 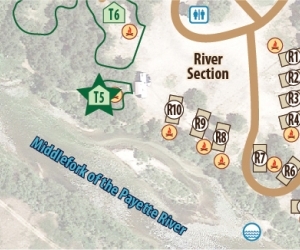 There are several rafting companies running trips on the South Fork and Main Payette just miles from our location. Come camping the night before or after a floating trip to extend the outdoor fun. We can host large groups and make special arrangements for events. Please call (208)462-8000 to speak with us about group rates. Pets must be on leashes/tethered/under control at all times. Pet droppings must be picked up immediately. 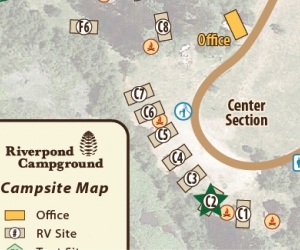 Noisy or aggressive pets may be asked to be removed from the campgrounds. 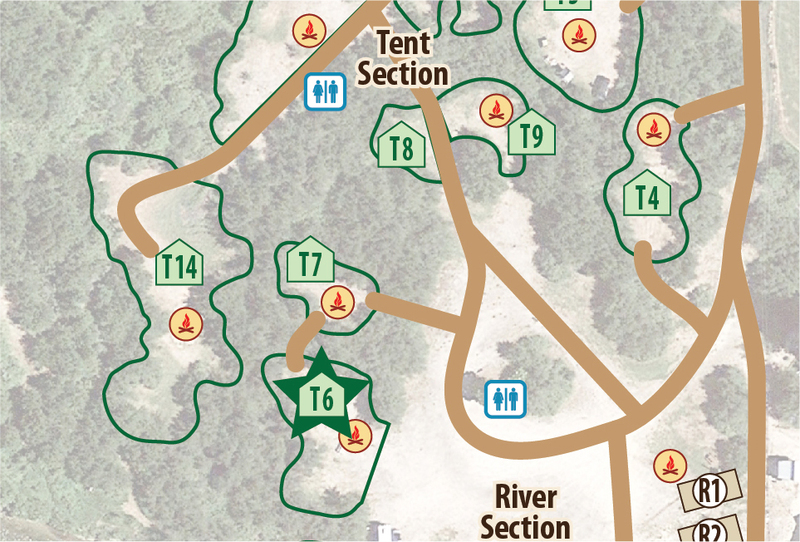 Animals found running loose will be regarded as stray and may be removed from the campgrounds.